Acne and the possible resultant scarring are two very distressing condition. Treating acne early will help prevent or minimize scarring and the treatment of existing acne scars helps alleviate anguish and embarrassment. The VBeam laser is the gold standard for reducing the chances of your acne leaving permanent scars. The laser is used in hospitals worldwide for the treatment of scars in the early stages of formation! The Doctors at the Baywood Clinic have used this laser successfully on thousands of patients. The VBeam laser can help reduce acne, acne scarring and post acne-redness. VBeam works by the absorption of laser light by a “target”. In the case of acne scarring, this target is the tiny inflamed and broken blood vessel groupings left after an acne lesion has healed. In most people who have experienced moderate to severe acne this redness persists for months to over a year and is the cause of great distress. Without treatment these red “blotches” can become permanent scars. The small vessels are heated to a high enough temperature to cause coagulation. They then close off, shrink and eventually are absorbed by the body. To protect the skin while still allowing the laser light to penetrate to the “target” vessels, the Vbeam incorporates a special cooling device. 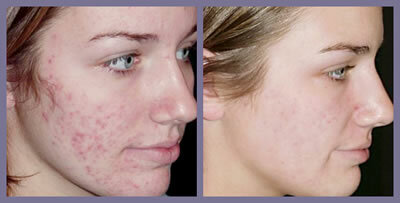 “All patients benefited from a 30-50% reduction in the post-acne redness after the first treatment. After three or four treatments, a reduction in redness of 75-90% was achieved.